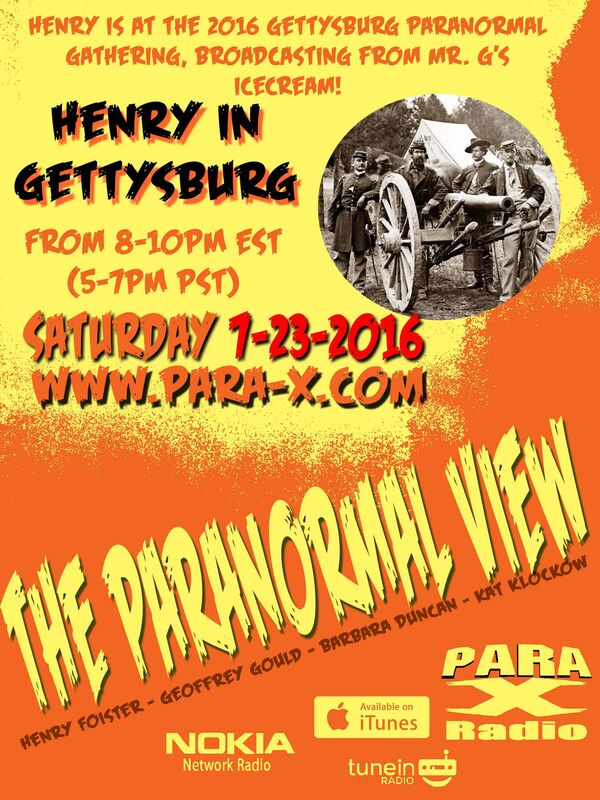 With Kat off this evening, on an investigation with Jeff Belanger, Henry was back broadcasting live tonight on location in Gettysburg, Pennsylvania, from Mr. G's Ice Cream. Also on hand was Craig Rupp, as well as shop owner Mike Gladfelter, who gave a quick history of the property, formerly the John Winebrenner house, aka Twin Sycamores. The bulding was occupied by Confederate forces in July, 1863, it is one of the best known houses from the Battle of Gettysburg. Mike has only had one experience; very clear footsteps coming up the steps during the wintery off season. He thought it was his ex wife coming up, and looked down to see an empty staircase. He discussed various groups who have come and investigating, getting great EVPs, one of which Craig had acquired. He spoke about the sycamore tree on his property. In the area trees that were alive during the War are called Witness Trees. Recently the sycamore was pruned, and anything over an inch in length Mike insisted being given to him, and they're being made into Witness Tree Christmas Ornaments. They're finally creating an official website, but they are on Facebook and on Twitter, the latter of which I jokingly admonished they need to get on that, as after joining in April 2015 they'd only had nine tweets, the "most current" one, as of this report's posting, being June 7th. Shop worker Abby Rasinska spoke about seeing a pot flying from the wall. A co-worker had an experience, hearing a knock on the back door, but no one was there when he opened the door. Next up Henry brought on Gina Bengston, who was an awesome guest, also promoting a big August 27th Para Party in Connecticut, with also a Ren Faire theme. Bringing us back from the second break, Ceiling Cat [CC] Barbara Duncan reported our having listeners tonight in the Canada, the US, England, and Singamore. Craig spoke abuut the Fairfield Inn, one of his favourite haunted places. Craig spoke about tourist trap "investigations" which are money pits; they'll have way too many people (and all of the amateurs), at Sacks Bridge, yapping away and contaminating anything one might catch. Craig did highly recommend Sleepy Hollow Tours. 30 July 2016 edition, at Mr. G's Ice Cream Parlour at the John Winebrenner House in Gettysburg, Pennsylvania.